There is a certain type of clock we usually refer to today as having a zigzag dial or even as a zigzag clock. The term describes the kind of engraving on the dial, a series of circles using rings of zigzag nature, such as can be seen in those examples illustrated here. It is a recent term, part of our attempt at setting everything into shorthand, a means of using one word recognition instead of a sentence. Once you have seen a zigzag dial you can hardly fail to recognise the same thing again. Zigzag dials were a simple means of decorating a dial with an engraving chisel, when used by someone incapable of freehand engraving. The way we think it was done was that the dial was pinned down onto a turntable, as was any dial sheet to be engraved, the engraving tool was rested in a guiding brace, as you might with a wood-turning chisel, and then the dial was slowly rotated on the turntable as the chisel was worked from left to right and back, thereby scoring a continuous zigzag line. Then, after moving on a space, the process was repeated. The result was a neat and surprisingly professional-looking pattern of circles around the dial centre. Occasionally a series of grooved circles would be 'engraved' between the rings of zigzags. The number of rings of zigzag circles would vary according to the size of dial and the whim of the 'engraver'. Most commonly it was three, sometimes two, sometimes four. This sort of engraved decoration is sometimes called 'wrigglework', and occasionally it was used in the dial corners or around the dial edge. The dial size varies from about eight inches to ten, but eleven or even twelve inch dials are not impossible. The clockmakers who made such clocks were aiming at a lower-priced market and would do what they could to keep the cost low, hereby hoping to bring as many people as possible into the price range as customers. For this reason such clocks often contain a higher proportion of iron to brass, especially when compared for instance to a lantern clock, which contained a very high proportion of brass. Not only was iron only about one tenth of the price of brass, but the men who made such clocks were often rural clocksmiths, to whom it was second nature to work in iron. Such men could forge, bend, twist and shape iron at will, whereas brass needed the skill of a brassfounder to cast it into the required shapes, and that was something not all clocksmiths could do. Sometimes we see the ironwork painted black against rust, but it is not certain whether this was done originally or was done by well-meaning restorers for preservation. 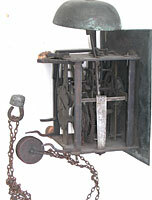 The hook-and-spike clock was the poor man's lantern clock. Its movement was not only cheap, but it was often heavy, strongly made, and made to last. The less affluent customer was probably far more determined to have a long-lasting and strongly-made product than his wealthier counterpart. 1. A zigzag dial, with three rows of wrigglework and with a series of wrigglework lines around the border. The first person I know of to write about these clocks was the late C.F.C. Beeson in his book, 'Clockmaking in Oxfordshire' first published in 1962. He identified these dials as being almost exclusively the work of a group of largely-Quaker clockmakers working in rural North Oxfordshire, one of the earliest being Thomas Gilkes of Sibford Gower, working about 1700 and perhaps the best known being his son, Richard Gilkes of Adderbury, working from about 1735. Beeson suggests Richard Gilkes may have been the first to start the zigzag fashion. There were other forms of decoration sometimes used by those who could not engrave. The cup-and-ring dial centre was one, which could be done using a drill. Most of these clocks have brass cast corner spandrels. They seem to have been limited to a very few patterns and it may have been that Quakers used a common source. An alternative to corner spandrels was to leave the corner totally blank, but more often a corner would be decorated with some kind of wrigglework engraved pattern. Quakers were not usually fond of fussy decoration, but perhaps they had to temper their personal preferences with those of their potential clients. One facet of Quaker belief was to be self-effacing, to pursue modesty, or, seen another way, to avoid the sin of vanity. Some believers, such as the American Shakers, took this to such an extreme they would not even mark their worktools with the name of the maker or owner, which tools they shared anyway for the public wellbeing. When such a believer died, nothing should remain to show that he ever existed and his tools and furnishings would pass down to the next craftsman for common use. To this end some Quakers even refused to have tombstones to bear witness to their passing. It is thought it was for this reason that some of these Quaker zigzag clocks were left unsigned. As time went by this virtue was followed less sternly, and increasingly we do find zigzag dials are signed with the maker's name. The movement of the same clock seen before restoration, the spikes being right-angled continuations of the rear upright bars. Quakers were often shunned by society at large, who were put off by their strange dress, behaviour or beliefs. Particularly in the earlier years they were trying to sell goods in a hostile market to those who shunned them and their strange ways. To do this, they had to keep their prices low, and to this end the zig-zag clocks were ideal, because the clockmaker could do a greater part of the work himself, without having to pay a professional engraver, which kept the price down. To sell into a hostile market Quakers had to offer a good product at the lowest possible price, which they did. Eventually it became well known that if you bought from a Quaker you were dealt with honestly and got a sound product which was good value for money. So that ultimately non-Quakers would even seek out Quaker craftsmen, who they knew would not cheat them. The famous London Quaker clockmaker, George Graham, is said to have acquired the nickname 'honest George Graham'. Quaker clockmakers would also trade amongst themselves. One who was expert at the craft of zigzag engraving might be willing to exchange his work for brass corner spandrels from a fellow-Quaker, who was a brassfounder. This is probably why we see zigzag dials, which are sometimes so similar they may have come from a single source, signed by more than one name - because they swapped skills between one another. So we can see very similar, if not identical, zigzag clocks which are unsigned as well as signed, but even perhaps signed by different people. By the later eighteenth century we see Quaker hook-and-spike clocks from this region which are signed and which have normally-engraved centres. Presumably the taste for fully-engraved dials took over and the zigzag type fell from fashion. 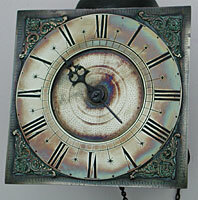 Most zigzag dials were made as hook-and-spike clocks to hang on the wall. They were seldom alarm clocks, usually being full hourly strikers. But occasional examples are found housed in full cases as longcase clocks. These examples tend to have no seatboard but the clock hangs from a hook in the backboard, just as it would from a hook in the wall. There are occasions where the hanging hook has clearly broken away or where the spikes have chewed too savagely into the backboard to the point where the clock no longer could hang safely, and in these instances a later seatboard may have been used as a safer fixing. It may have been that this form of clock could be bought by those less affluent customers, who could not afford a longcase at that time, but might well have done later, when their finances improved. This means that such a clock housed in a later longcase may not be a 'marriage', but may have arrived that way as a natural part of its history. Note. A more extensive version of this article appeared in Clocks Magazine.